Tichy/Sutton Productions kicks off the 5th annual Bash Fest at newly renovated The Yost in Santa Ana, CA on January 24th, 25th and 26th, 2018. For three nights, some of music’s most prolific artists have been confirmed to pay tribute to their heroes for a legendary weekend of music and madness. Producers Brian Tichy and Joe Sutton have been creating unique celebration concerts for the past several years, and have now combined them into one weekend of All-Star mayhem to coincide with NAMM, the largest music convention in the US on January 24, 25 & 26, 2018. For the first time in Bash Fest history, Wednesday, January 24th, 2018 kicks off with All-Star jam night Soundcheck Live. 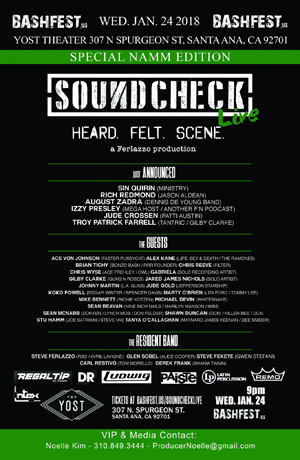 Soundcheck Live is a monthly Hollywood jam series that features some of LA’s most notable touring and session players and marquee musical talent. 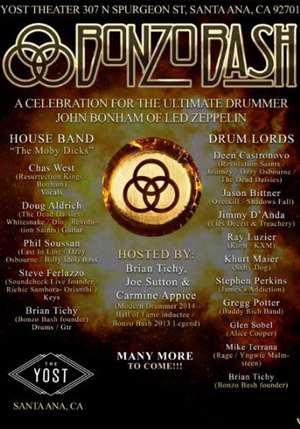 The second night of Bash Fest features always sold-out, Bonzo Bash. This is the first of these shows the Tichy/Sutton team produced, with the first one taking place September 25th, 2010, on the 30th anniversary of Bonham’s passing. This concept was created by Tichy to celebrate the drummer most consider the greatest in rock n’ roll: John Henry Bonham. They have since taken the show to not only Russia but both US coasts, with BashFest 2018 sure to be the mightiest one yet. The show highlights the industry’s top drummers playing their favorite LED ZEPPELIN tunes. Each drummer will be accompanied by house band THE MOBY DICKS. Rounding off the weekend will be the 3rd and final show of Bash Fest taking place on Friday, January 26th, 2018 with Randy Rhoads Remembered, a celebration of the brilliant and original Ozzy Osbourne guitarist Randy Rhoads. 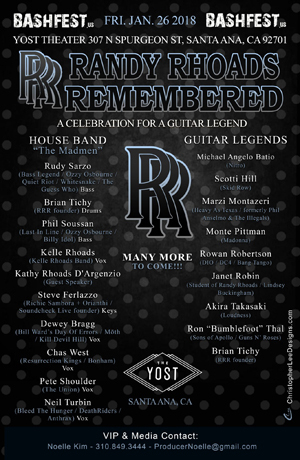 Tichy and Sutton created this event in 2013 after agreeing Randy Rhoads surely deserved recognition for his musical impact. They are both huge fans of Rhoads’, and Tichy himself played with Ozzy Osbourne. Randy’s brother Kelle Rhoads performs and his sister Kathy Rhoads D’Argenzio shares her stories making this a very touching and personal experience for all involved.